"LOVE DIVINE 5 IS DELIGHTFUL"
The excellent new album Love Divine 5 is certain to bring you many years of delightful and inspirational moments. 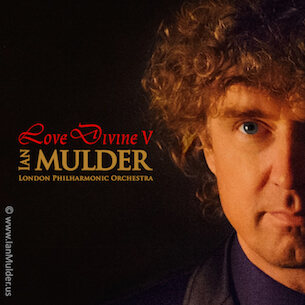 Pianist Ian Mulder composed the music for piano and orchestra based on very beautiful hymn tunes, such as "Turn your eyes upon Jesus", "Blessed assurance", "Love Divine, all loves excelling", "Holy, holy, holy", "There is a fountain", "The fragrance of Your love", "My country, 'tis of thee" and many more. Mulder conducts the London Philharmonic Orchestra and plays the solo piano part simultaneously. The piano soloist, whose passion, like silk, floats down and surrounds you, and the orchestra, as well as the sublime sounding boys choir Libera that appears on this album three short times, display musical perfection. Caressing. Absorbing. Flow with the sound and take a free-fall ride on the heavenly feathers of Mulder's musical sensitivity, soothing your ears and soul with a smile. Sheet music and backing tracks are available here.